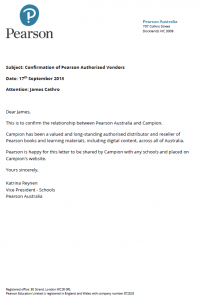 Home > News > Campion MyConnect – Authorised access to Pearson’s digital content. We have authorisation from Pearson to sell, provide and host their digital resources within our platform – Campion MyConnect. Campion Education is also the only e-text distributor who has GITC accredited (GITC number Q-6205 – Qassure number 15341) and is an approved supplier to the Department of Education and Training for the provision of classroom resources on Standing Offer Arrangement (SOA)DET65864. If your school is looking for a cost-effective solution for your digital resources, contact us today to arrange a free trial.